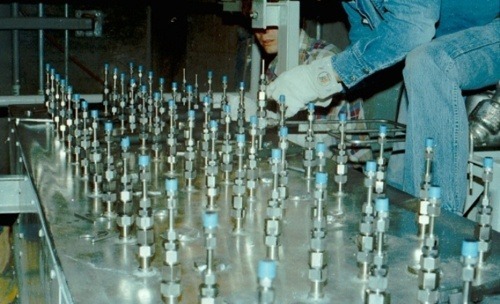 On April 19, 1984, eight workers entered the seal-table room at Sequoyah Unit 1 in Tennessee to clean the incore-probe thimble guide-tubes while the reactor was operating. The incore probe is a neutron detector on the end of a long, flexible cable that is normally stored in a shielded location outside the reactor core. Periodically, the probe is inserted through a number of thimble guide-tubes located within the reactor core to determine the power distribution and calibrate the ex-core power monitors. 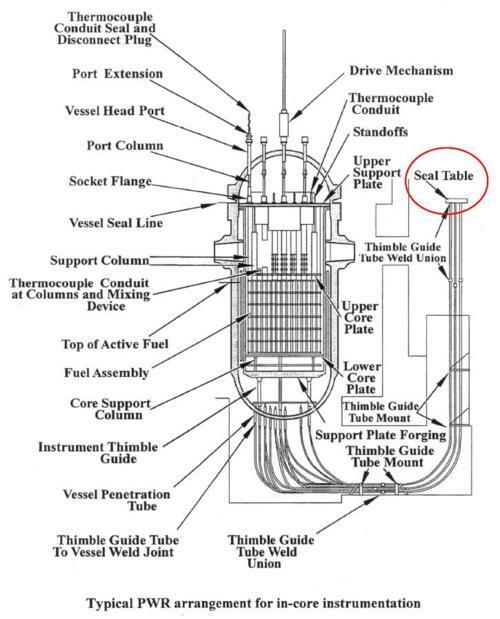 Figure 1 shows a cross-section view of the reactor vessel with the thimble guide-tubes and the seal table (in the red circle) to the right. The seal table in Watts Bar Unit 1, a sister plant to Sequoyah Unit 1, is shown below. The thimble guide cleaning procedure required the workers to disconnect the thimble tubes leading from the seal table and insert a cleaning brush assembly. While the cleaning assembly was being hand-cranked through one of the thimble tubes, workers noticed water pooling on the seal table around the fitting holding the guide tube that was being cleaned. The eight workers immediately evacuated the seal-table room. Shortly afterwards, the fitting broke loose, ejecting the entire thimble guide-tube and cleaning assembly from the reactor core. An un-isolable reactor coolant leak ensued. The hot reactor water flashed to steam as it shot out into the room. The leakage, initially about 30 gallons per minute, continued for approximately 11 hours until the reactor was shut down and the reactor water level was reduced to below the seal table. Approximately 16,000 gallons of radioactive reactor coolant leaked into the containment during this period. Radiation surveys conducted the following day indicated radiation levels of 2 to 3 rem per hour at the entrance to the seal table room, 200 to 300 rem per hour at the end of the thimble tube near the seal table, and greater than 1,000 rem per hour in the center of the ejected tube. The tip of the thimble tube was reading approximately 4,000 rem per hour. A lethal radiation dose is 450 to 600 rem. TVA’s internal report on this incident revealed just how close this call was. While the workers were inside the seal-table room, another group of workers arrived in the area to perform maintenance on the airlock door used to enter the room. They disabled the airlock’s outer door for nearly 30 minutes while doing some welding. With the outer airlock door disabled in the open position, the inner airlock door was interlocked closed. The workers inside the room would not have been able to evacuate the room quickly. The steam conditions and the radiation levels inside the room would have threatened their lives had their exit been delayed just a few seconds. When the incident occurred, the workers estimated they left the room in about 20 seconds. When they got into the airlock, one of the workers picked up the telephone to inform the control room operators about the leaking reactor water. The phone line was dead. Luckily, only the phone line was dead. There’s talk about building new nuclear reactors in the United States. The nuclear industry probably should not buy lottery tickets in an effort to finance any new reactors. If not used up in past events like this one, their luck should be preserved for protection against future miscues. The work-control group should never have sent workers to perform high-risk activities inside a room shortly before other workers disabled the only exit door for that room. And before disabling the only door to a room, workers should have checked to ensure no one remained inside.